Flushing Options: Which to Choose? Toilet Manufacturers: Is Any One Manufacturer Better Than the Next? So Which Toilet is Best for You? Are you considering the purchase of a new toilet? Read through our best toilet reviews to find out what else you should be considering. You may be wondering if purchasing a toilet is even necessary, much less important enough that you need to have the best one. The truth is that a toilet is a major appliance in your home, and there are a number of factors you should consider when purchasing one. Cost is only one of these factors, and it may even be the least of them. 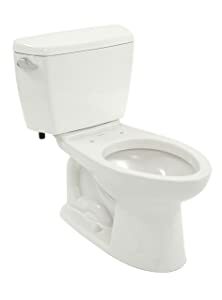 Did you know that on average the toilet remains in service for 15 to 25 years before being replaced? That is longer than most, if not all, of the other appliances and fixtures in your home. With a 25-year service life and its heavy use, the toilet is going to use a lot of water, and it’s comfort and durability are going to matter. On average, the toilet uses between 40% and 75% of the water in a home. That said, the water efficiency of a toilet will have a long-term effect on the cost of water usage. The more efficient the toilet, the less you will spend on water, and over potentially 25 years, those savings can add up. Buying a toilet is actually an investment, and making the right decision is a matter of knowing what’s important and what to look for in a toilet. Since most people don’t have a lot of time to put into choosing the best flushing toilets for their homes, we’ve put together some recommendations to help you choose the best toilet. We are going to educate you on all aspects of making a toilet purchase later, first let’s look at some of the best toilets from four of the top-rated toilet brands. It’s not just a coincidence that the champion of our best toilet reviews is the Champion. This aptly named toilet is backed by one of the best toilet brands in the industry and is offered with a 10-year manufacturer warranty. 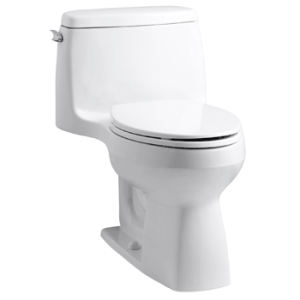 American Standard uses its Champion 4 flushing system to flush with 1.6 gallons of water reliably. 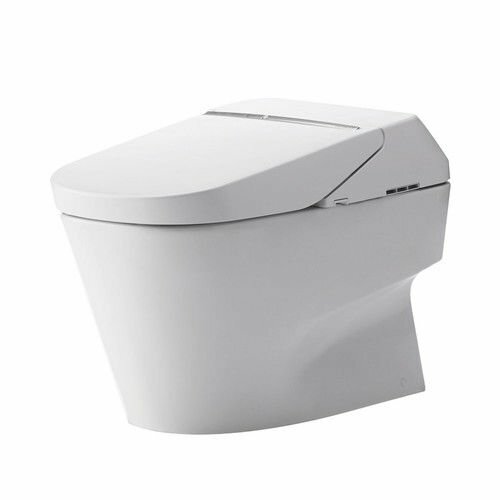 Features such as a self-closing, flapper free, piston action, Accelerator flush valve and a siphon action, jetted bowl with a fully glazed trap way make the flushing system efficient and effective. MaP testing results indicate that the Champion 4 is capable of flushing a greater mass than other toilets, up to 1000 grams. The Champion 4 is available in a durable, antimicrobial, Everclean finish in white, bone, linen, silver, and black. 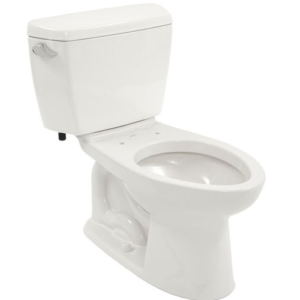 This 2 piece, ADA compliant toilet offers comfort with an ideal seat height and an elongated bowl design. It may seem odd that the most expensive toilet in our reviews (up to 10 times the cost of others) is our #2 favorite, but considering the long lifespan and lower operating cost, the Neorest 550 is worth the money. This WaterSense certified toilet uses as little as one gallon per flush, saving you money with reduced water usage over its lifetime. TOTO’s Dual-Max flushing system achieves both efficiency and performance with user-controlled options for either 1 or 1.6 gallons per flush. You might be interested in checking some other best dual flush toilets out there in market today. Unique features such as its automatic seat with built-in heater add luxury to the efficiency and performance. TOTO’s SanaGloss seals the surfaces with an ultra smooth finish that prevents particles from adhering to it, with a catalyzed ion barrier actually repels particles. These features result in a finish that is highly durable and resistant to staining, bacteria, fungus, mold, and other microbes. 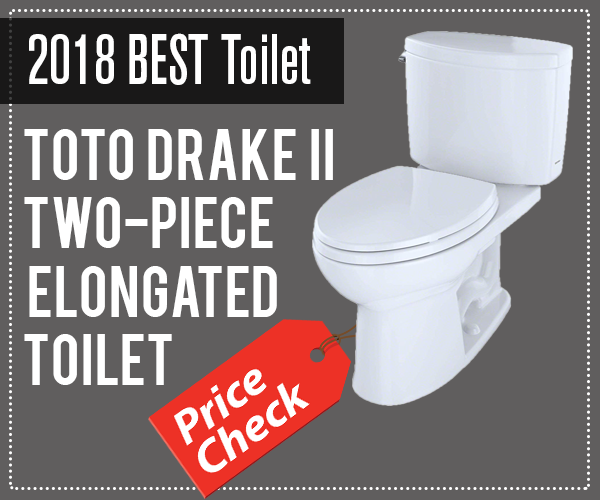 The TOTO Drake fits right in with the other 2 piece toilets on our list, both in price and style. The Drake’s powerful and efficient flush uses 1.6 gallons per flush. Its classic styling and glazed cotton white finish will fit nicely in any modern bathroom. Installation is a breeze with its lightweight, 2-piece construction, and its ADA compliance make it a versatile option for anyone needing to accommodate handicapped users. It weighs approximately 103 pounds with dimensions 28 x 19.5 x 28.5 inches. Overall it has average dimensions making it perfect for nearly all types of bathroom measures. The Drake’s flushing system uses an extra wide trapway and flush valve to increase water flow for cleaner flushes and reduced clogging. An elongated bowl design makes it an aesthetically pleasing design that maximizes user comfort. 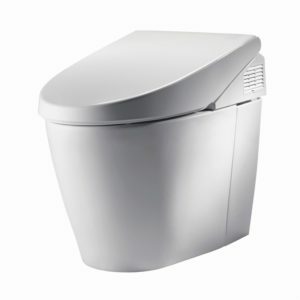 The Utramax is one of TOTO’s most popular toilets for good reason. It’s attractively priced for such good looks and quality. This WaterSense approved toilet only uses 1.28 gallons per flush with its water-efficient flushing system. User comfort is enhanced by its comfortable seat height, which makes it easier to sit down and stand up for all user ages and heights. The Ultramax II uses a flushing system with an integrated cyclone design that ensures a clean flush every time you press the lever. For such a powerful flushing system, it’s remarkably quiet, with a smooth flush that won’t wake the whole house. TOTO’s unique Sanagloss provides an attractive, glossy finish and an ultra-smooth surface that is easy to clean and resistant to corrosion and stains. Sanagloss is also resistant to mold, mildew, and bacteria growth. Kohler keeps the price of this basic, single piece model competitive with the TOTO Aquia, and with its simplicity, there isn’t much that can go wrong. It’s a full-size toilet, so it’s single piece construction makes it a bit bulky to install, but it’s definitely manageable. Kohler uses its proprietary AquaPiston® flushing system to achieve an ultra-efficient, 1.28 gallons per flush. This model is available in seven standard finish colors, and multiple distributors offer quick shipment and delivery. 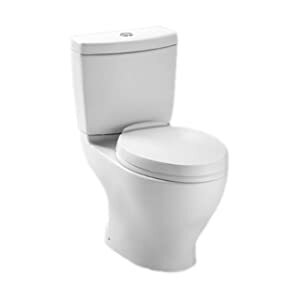 If you are looking for an extremely efficient toilet at a great price, this is a great option for you. This toilet fits right in with the other 2 piece designs in our list, with both it’s traditional, simple yet elegant styling and its competitive pricing. Its powerful dual flush system gets the job done with one gallon per flush for liquids and 1.6 gallons per flush for solids. 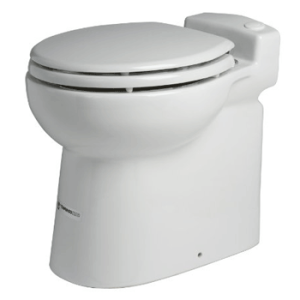 Compliance with ADA requirements and WaterSense Certification make the H2Option a versatile toilet that is representative of the quality that is expected of American Standard. Your choice of white, linen, or bone finish is sure to look good in any bathroom, regardless of the style. You can never go wrong when you pick up a toilet with classic styling like this one. Saniflo offers this dual flush, compact toilet as a stylish solution for anyone looking for clean styling and efficient performance at a reasonable, mid-range price. In fact, its low price makes it stand out among similar but higher priced products. Its tankless design utilizes a powerful pump for flushing, and at only 1 gallon per flush, it’s a super-efficient. Saniflo offers this model in a white finish to meet the needs of the majority of bathroom designs, and its compact size makes it an easy fit and easy to install. If a tankless toilet is what you’re after, this Saniflo model makes for a great option. 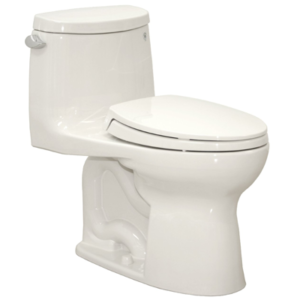 This two piece, dual flush toilet is about as basic as they come, and it boasts a price to match. It’s available in five standard color options and can be delivered within a few days of ordering it online. It is competitively priced, easy to install, and its Dual-Max dual flushing system allows you to select from the super-efficient, 0.9-gallon flush, or the standard 1.6-gallon flush. Consumers like its simple design, clean styling, and affordable price. 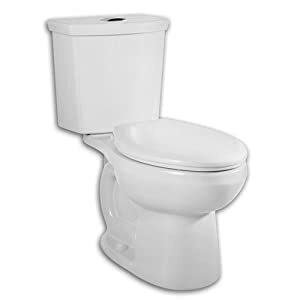 Here is a brief and simple, side by side toilet comparison of the best toilets reviewed. The toilets are listed in order from #1 to #8. In order to understand what to look for when purchasing a toilet, it is helpful to have a basic understanding of how a toilet operates. What are the major components and how do they work? What parts of a toilet can wear out or malfunction? You don’t need to be a professional plumber to evaluate your options, identify the best toilet brands, and make the best choice for your home. Before we examine the workings of a toilet, let’s look at the different types of toilets in use today. Non Flushing Toilets do not use water to flush waste into the sewer. This includes portable toilets and other designs that are ideal for use outdoors, in recreational vehicles, seasonal cottages, or other applications where a continuous supply of running water is not feasible. Non flushing toilets, also called alternative toilets, use either composting, heat, or chemical treatments to help dispose of waste. Incinerating toilets use electricity to heat waste so that it will combust, while chemical toilets use special chemicals to break down waste into byproducts that can be more efficiently stored and disposed of. Composting toilets simply deposit waste into a composting bin where waste is decomposed and stored until it needs to be emptied. Flushing Toilets use water to evacuate waste and transport it into a sewer system. Modern flushing toilets are based on a design that has been around since the 16th century when Sir John Harrington invented it and saw to its use in Queen Elizabeth’s palaces. The primary functioning design of a toilet depends on the siphoning effect, similar to a simple straw. 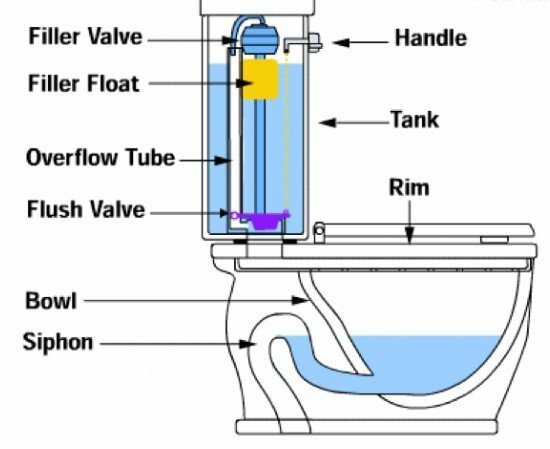 The below diagram shows a cross-section of a toilet bowl and the siphon. The handle is connected to the flush valve, usually with a small chain so that when the handle is depressed, it opens the valve. With the valve open, the water in the tank floods the bowl, causing the water level to rise above the top of the siphon. As water drains downward from the siphon, a pressure differential between the bottom of the siphon and the bowl causes the water in the bowl to evacuate. As the water level in the tank drops, a float opens the filler valve, which begins to refill the tank. When the tank is full, the float closes the valve, and the toilet is ready to flush again. In the event the float or valve becomes stuck, the water overflows into the overflow tube and drains out the bottom and into the bowl. Here is a link to a more detailed narrative of how flushing toilets operate. As you can see, there is more to a toilet than one might think, considering the fact that it’s been around for hundreds of years. Also, considering the likelihood that your toilet will be in service for many years, the decision of which toilet to buy has lasting implications that make it worth the time it will take you to learn about your options. Let’s take a look at three areas of consideration that are important. Water usage and efficiency are factors that will affect the long-term costs, as well as the overall flushing performance. Did you know that did you know that nearly 70% of your daily water usage goes down the drain? 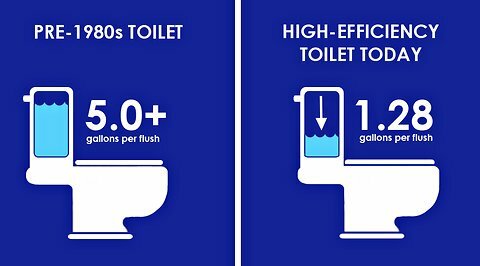 Older toilets average flush approximately no it 4 gallons of water, but the modern units are designed to use only 1.6 gallons per flush. As you can imagine there is a trade-off, and it’s a lot harder to flush with only 1.6 gallons, then it is to flush with 4 gallons, and flushing technology should not be overlooked as manufacturers make up for a lack of water with improved designs. Naturally, humans tend to look for the simplest solution to the problem of reduced flushing performance, and that solution turns out to be simply flushing twice. This double flushing results in increased wear on toilet components and increased corrosion and staining. The dive to conserve water and still have an effective flush action prompted manufacturers to go back to the drawing board and design toilets that can do more with less. Toilet manufacturers have addressed the problem of inadequate flushing by placing, waterspouts in the bowl in more effective locations and utilizing both gravity and increased water pressure to flush more effectively. The key to buying a toilet that flushes well is to read product reviews such as this one as well as consumer reviews to identify the best performing toilets on the market. There are a number of flushing options that affect how the toilet looks and operates, and the two most basic options are gravity-flush and assisted-flush. The most common gravity-flushing option is operated by a lever handle mounted on the tank, and depressing the handle operates the flushing mechanism. Variations of this design include dual flush, a push button flush, and a tank mounted pull cord or chain on an overhead wall mounted tank. Assisted flush options include gravity assisted, power assisted, and pressure assisted flushing. Tank mounted flush levers are the most common type of flushing option, and they are operated by pulling a chain that is inside the bowl and connected to the flush valve. Flush levers may be made of plastic or other lightweight, high-strength materials such as PVC, or they may be made of cast metal, cast aluminum, or bronze with a plated finish. Plastic handles are less expensive but more susceptible to wear and breakage. One thing to consider is whether or not the flush handle is replaceable and compatible with the many aftermarket handles or levers that are available. Push button flush operation is becoming more popular for two common, specific reasons. The cleaner, more streamlined look of a recessed flush button is more aesthetically pleasing to some, and the fact that it’s recessed makes it less susceptible to breakage than a lever. Another reason is that dual-flush toilets are becoming more popular, as they offer both a low-flow flush and a high-flow flush option, which are operated by separate buttons in a shared recess. Alternatives to the attached flush lever or button include the pull cord or chain operated flush and the sensor operated (automatic) flush. 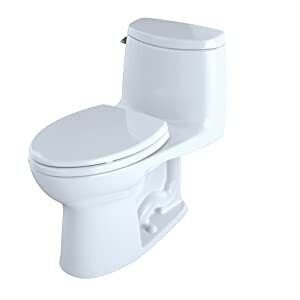 Pull type flushes are used for toilets that have a separate tank that is mounted on the wall above the toilet which utilizes gravity and added height to accelerate the flush water for better performance. Sensor activated or automatic toilets use a photoelectric sensor to detect movement or the proximity of a user, which in turn activates an electric valve that flushes the toilet. Assisted flushing may be operated by a lever or a push button in the case of power or pressure assisted flushing, while a pull type operation is used on wall mounted tank, gravity assisted. 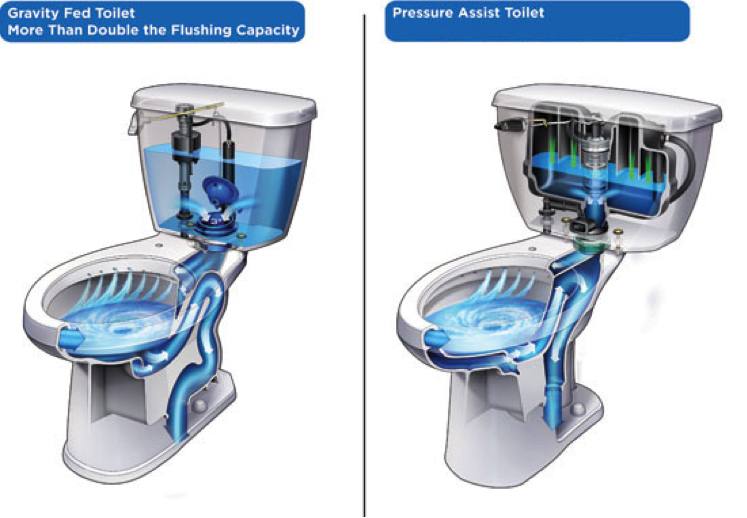 Pressure-assisted toilets use high water and air pressure and nozzles to facilitate more efficient flushing, while power-assisted flushing is accomplished by accelerating water through the toilet with pressurized air provided by an internal, powered air compressor. 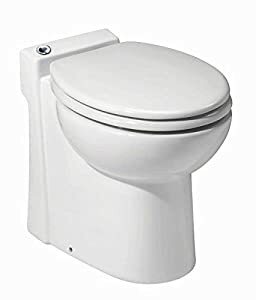 The majority of toilets use gravity assisted flushing, with gravity accelerating the water into the bowl, from a tank either directly atop the bowl or mounted on the wall above the toilet. Either of the assisted flushing options can be operated by levers, push buttons, and sensors. The shape and design of the toilet bowl and tank also affect how the toilet looks and operates, but it is mostly a matter of aesthetics and personal choice. There are two basic designs for the bowl and tank, that are essentially the same aesthetically, with the tank located directly atop the bowl, one option with the tank attached (built in), and one with a separate and removable tank. Less common is an option with a detached, wall mounted tank, chosen either due to aesthetics or to the improved flushing action. 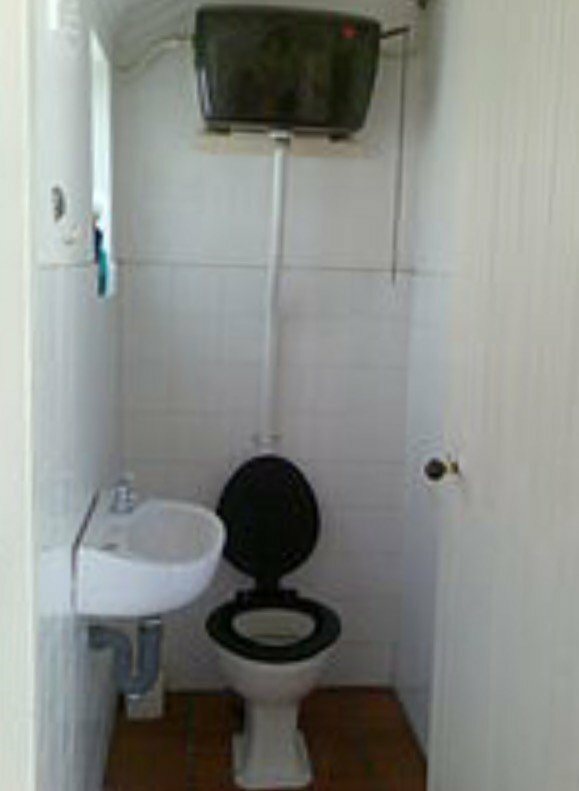 A far less common option is the tankless toilet, which uses high water pressure to flush rather than gravity and a tank. Aesthetics may play a role in your decision as some find the cleaner look, simplicity, and lower profile of the built-in tank. Size may also be a factor, as removable tank designs tend to be larger and require more space. Since most modern toilets use only 1.6 gallons of water per flush, toilets with a built-in tank can be designed to be quite compact, which may be suitable for smaller bathrooms. Performance is also a consideration when selecting a tank design, with tankless and pressurized toilets at the high-performance end, followed by detached (wall mounted) tanks, then followed by built-in or two-piece assembled toilets. The shape of your toilet may be determined either by its aesthetic appeal, available bathroom space, or function (flushing option). You may prefer a traditional, rectangular shape, a classic round shape, or a more modern, oval shape. 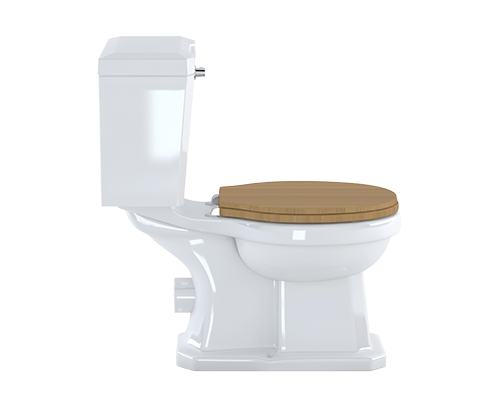 If you are purchasing an elevated tank toilet your shape options may be limited to a more rectangular tank shape. There are obviously going to be a lot of manufacturers of a product that is used by people all across the globe, and that holds true for toilet manufacturers. But just how important is the manufacturer when it comes to a product as common and as old as the toilet? You may be inclined to approach your toilet purchase with an “a toilet is a toilet” approach to brand selection, but be forewarned that as many manufacturers as there are, there are going to be some good, some poor, and only a few “best.” From a purchase cost standpoint, it’s one of the lower cost appliances in your home for the amount of use you will get out of it. If you are going to have people using it multiple times daily for up to 25 years, it makes sense that the purchase cost may not be as significant a factor as having a dependable brand standing behind your toilet is. Our best toilet reviews include products from four of the manufacturers of top rated toilets: American Standard, Kohler, Saniflo, and TOTO. 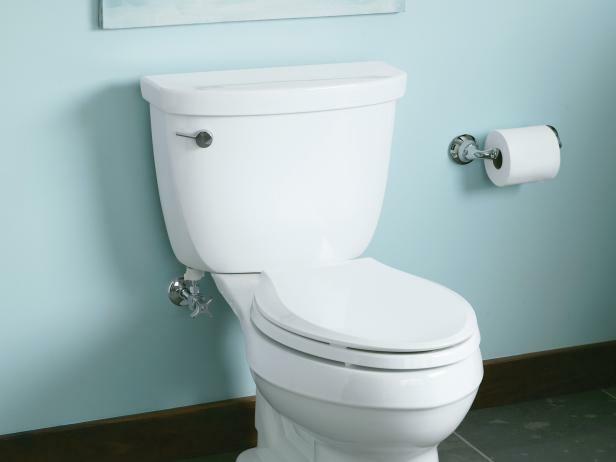 American Standard is a long-standing brand with a history of producing the finest toilets and best flushing technology with durable and quality materials. Using an old-school approach to for the manufacturing of toilets, American Standard rests at the top of the list above their competitors, with the most customers in the industry. American Standard blends new age and old school features, and of all the four brand options we reviewed, we think American Standard is most likely to be chosen by any buyer. The manufacturer has also kept its price quite reasonable which is believed to be the core aspect of attracting buyers. Kohler has been in the plumbing business for well over a century, and Kohler bathroom products can be found in use all over the world. Their flushing toilets push the edge of the envelope with cutting-edge designs and flushing technology that focus on unique styles, innovation, and performance. Kohler offers brand recognition, the longest warranty, and a responsive customer service department that is available to assist you 24 hours per day. In addition, Kohler offers the most accommodating toilets and the easiest installation guidelines available. With Kohler’s installation guidelines and a bit of plumbing experience, you can install most Kohler models yourself. Along with the convenience of availability that you get with an internationally recognized brand, with Kohler, you can expect lightning fast shipping from one of many worldwide locations. Saniflo offers luxury products with innovative designs at a very reasonable price. Saniflo’s Sanicompact has proven itself to be a competitor to TOTO’s Neorest model, which is no minor accomplishment. In addition to the Sanicompact, the products boasting the price stability and quality standards of the Saniflo brand abound. Consumers love quality and they love reasonable prices even more. TOTO is a brand for lovers of innovation. From its beginning as a small Japanese manufacturer of sanitary ceramic products at the turn of the 20th century, TOTO has established itself as a global brand. TOTO toilets have numerous cutting-edge features to choose from, and they are always improving their more established product lines. TOTO products are true to the Japanese legacy of quality and innovation and they represent the top in the industry. TOTO is famous for making toilets so great, and owners of the older models are so satisfied, that they don’t give much thought to needing an upgrade. Toilets are not a particularly desirable focal point, and as a result, they tend to be placed against walls, in corners, or in stalls, where size and space become an issue. The manufacturers have picked up on the trend towards modern, contemporary, low profiles, and architects are exploiting these new designs to make bathrooms feel more spacious. As with any appliance, it’s helpful to get an up-close look at a toilet and a good feel for its size before you buy. Installing a toilet isn’t as complex as installing a window, but there are measurements that should be confirmed before making your purchase. You will want to measure out the space where your toilet will be installed, specifically with respect to the distance between the wall and center of the drain pipe (flange) in your floor, called the “rough-in” distance. The drain pipe location and the horizontal depth of the unit determine the standoff distance between the back of the unit and your wall. You will want sufficient clearance to give you access to the tank and water inlet fixture for future maintenance. You will also want to mind the clearance between the toilet and your other bathroom fixtures such as the sink or vanity, the bathtub, and the door to the bathroom. The mounting bolt locations for toilets have been standardized with respect to their distance between each other (there are two mounting bolts), and their distance from the center of the drain pipe. Verify that the mounting bolt holes in your toilet will aline with the holes in your floor. The thickness of the base is also something to consider, to ensure that the mounting bolts you are using are long enough. If the base of the toilet is particularly thick, you may need to purchase longer mounting bolts, which are typically a lag screw stud on the floor end and a threaded bolt with washer and nut on the other end. Some modern toilet designs are for freestanding applications, that is the toilet is located some distance away from the walls, sink, and bathtub. Freestanding toilets are often tankless, and the water inlet connection is under the flooring or inside the toilet. One advantage to this type of installation is that it leaves plenty of space around the toilet for cleaning, rather than tucking in a corner where it’s a pain to access and keep clean. 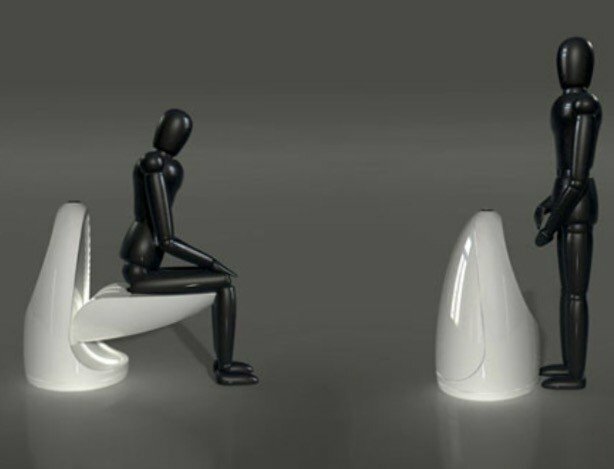 Such toilets take up minimal floor space, rather than an entire corner of the bathroom, and some designs are even more compact, and easily fold out to transform from a space-saving upright urinal to a seated toilet. We’ve learned that toilets often remain in service for up to 25 years, so it’s obviously important to consider the long-term performance and reliability when purchasing a toilet. It would be simple enough just to suggest that you compare warranties between manufacturers and products but there are more to a toilet warranty than meets the eye. All toilet warranties are limited, meaning that they are in effect for a specific time period or that they only cover certain components, functions, or failures. Warranties often differentiate between coverage of materials and coverage of labor. For example, the ceramic bowl and tank may be covered for breakage, cracking, or deterioration of the ceramic itself for one period of time, while the hardware is covered for another period of time, and the installation is covered separately. 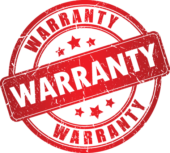 It’s important that you read and understand the warranty coverage before you buy. It is uncommon for manufacturers to offer a warranty on the installation of any product, as that coverage is logically provided by an approved installer. 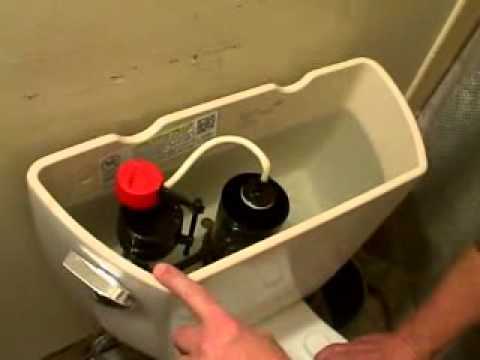 If you are installing a toilet yourself, you will want to make sure that you are not voiding the warranty by doing so. Maintaining warranty coverage usually requires filling out sending a product warranty card to the manufacturer within a maximum time period from the date of purchase, be sure that you understand what your warranty covers and how to guarantee that coverage. In all likelihood, any modern toilet is going to outlast the warranty, which is generally only one year for installation, three to five years for finish, materials, and workmanship, and possibly longer for hardware. Of course, a warranty may give you some long-term peace of mind, but what you really want to know over the long term is: “How well does this toilet perform?” So what exactly are we talking about when we say “long-term,” and “performance?” Knowing that a toilet can be expected to remain in service for 10 to 25 years, you know that essentially you would like your toilet to effectively and efficiently do what it was designed to do for that same 10 to 25 years. The best way to evaluate long-term performance is to compare product ratings and product reviews. Product ratings are generally determined by meeting third-party test criteria, including hardware use and abuse testing, pressure and leak testing of plumbing components, and wear testing of materials and finishes. Test results are used to assign ratings, such as number of consecutive flushes, or water leak test pressure: the higher rating being indicative of higher performance. MaP Testing is relatively new to the toilet industry, but it is a great way to find out which manufacturers are putting out the best performing toilets. Durability can be demonstrated by performance testing, but the best indicator of durability will be consumer reviews. It wouldn’t be practical for manufacturers to evaluate their products over the course of a 25-year installation, as the product would be outdated by the time the testing is completed. Consumers, however, do evaluate their toilets over the long run, and their opinions can be found with a bit of online research. Be sure to do your homework and find out what users are saying about a certain product. We have gone through the exercise of compiling a good bit of information about toilets for you. We’be looked at current trends in both design and technology, examined how they have affected the toilet market, and what they can offer you. Our reviews include toilets that will only cost a few hundred dollars to ones that can set you back a few thousand dollars. We’ve looked at every feature and can confidently make recommendations, but the fact is that only you know what’s important to you. Our top recommendation is that you try to put the price at the back of your mind and think about the fact that you are likely going to be using your next toilet for 20 years or more. How do you want that toilet to perform? How do you want it to look? These are simple questions that should make it easier to decide. A word on installation – Not many people know just how easy toilets are to install. It’s an intimidating task, particularly if you are replacing an old toilet, and it can get dirty. When it comes down to it though, it’s as simple as two bolts and one water supply. Check out this super handy installation guide. In closing, the internet is an incredible resource for those making just about any purchase these days. Product reviews are everywhere and are great if you want to know more about a product. Don’t discount the value of actual consumer reviews though, as they include comments from people who have actually used a product. Amazon is a great place to find consumer reviews, so be sure to read some before you buy. We’ve shown you our top toilet reviews, and we’ve found our own favorites, but you don’t have to take our word for it. Spend a day looking at your options to see what makes sense for you.